Home Press Release Field Programmable Gate Array (FPGA) Market is estimated to grow at 5.7% CAGR by 2023. According to the new market research report by IndustryARC, “Field Programmable Gate Array (FPGA) Market – By Technology (SRAM, ANTIFUSE, EPROM, EEPROM); By Memory (Distributed Memory, Block Memory); By Applications (Industrial, Medical, Communications, Aerospace & Defense) & Geography- Forecast (2018-2023)”, the market is estimated to grow at 5.7% CAGR to reach $6.68 billion by 2023. Asia-Pacific held a major share in global Field Programmable Gate Array Market followed by Americas and Europe region. APAC FPGA market accounts for over 35% of the total industry share. The emergence of innovative FPGA products, particularly for use in consumer electronics devices has increased market value in the region. Growing demand from automotive production in China, India, and Japan will spur the market growth further. Asia Pacific is also predicted to outpace all other regions when it comes to growth rate by registering a CAGR of 7% from 2018 to 2023. Rising smartphone adoption combined with replacement of ASICs with FPGAs for this product will drive the market. Rising telecom infrastructure development in Asia-Pacific and Africa will drive the market. Since the telecommunication sector is the major end-user of FPGAs, there will be a huge demand for FPGAs in this region as growing infrastructure development drives the market. APAC is one of the largest manufacturing hubs in the world for the automobiles, and the growing integration of FPGA based systems in automobile applications is likely to boost the FPGA market in this region. Countries such as Japan, China, India, and South Korea have transformed themselves into hubs for consumer electronics and automotive manufacturing, which has played a crucial role in shaping the industry in the region. Americas FPGA market accounts for over 33% of the total industry share. Demand from the Americas market is driven by the growth of industrial automation and increased deployment of ADAS systems. Also, Americas expected to grow at a CAGR of 5% to reach $2.2 billion by 2023. Value chain analysis is a useful tool to analyze the activities that include analysis of FPGA design, software and hardware procurement, testing and offering of FPGA devices to end-user industries. 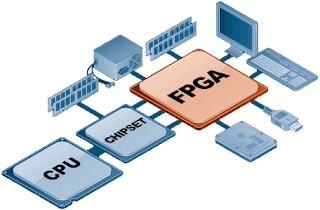 The above figures depict the various stakeholders in the FPGA market. The R&D departments of the companies are involved in the development of effective design flows and Intellectual Property (IP) cores. These research groups also comprise of product managers where the future applications and requirements of FPGAs are being envisaged. The FPGA manufacturers procure key components such as IP cores and circuit components from suppliers and assemble them in FPGAs. Semiconductor fabrication plants form an important part of the FPGA value chain. Fabless FPGA manufacturers such as XILINX INC., depend on these foundries for the production of FPGA devices. After fabrication, these devices are sent to the testing and assembling units for post-integration verification. There are several industry-specific standards such as IEC 61508 associated with the utilization of FPGAs and the functionality of FPGA devices are required to have complied with these standards. Increasing applications in military & aerospace, consumer electronics, and the automotive industry is a critical factor escalating their growth in newer segments and are presumed to drive the FPGA market over the coming years. A growing need for customization of functionalities such as erasable and programmable memory and high demand for ADAS (Advanced Driver Assistance System) for GPS control and 3D visualization in the automobile sector is driving the global FPGA market. Growing penetration of FPGA technology in automotive and consumer electronics sector is driving the growth of the FPGA market, particularly in the Asia-Pacific region. Rising demand for high-speed data processing coupled with the emergence of data-driven technologies such as the Internet of Things, Big Data Analytics and Machine learning are boosting the FPGA market across the globe. The benefits of Flash-based technology compared with SRAM-based programming technology are forcing the uptrend for the usage of anti-fuse technology based FPGA market. Furthermore, the growing utilization of smart-phones, gaming and wearable devices is also contributing to the demand for FPGA in the consumer electronics industry across the globe. FPGA market is a duopoly wherein, Xilinx is the leading player contributing to nearly 50% of overall revenue. The company being a pioneer in FPGA has remained as the dominant player. This company is followed by Intel with a market share of over 36%. Intel is establishing increased revenue in the FPGA market as the company penetrates the consumer electronics sector. These two players account for over 86% of the total market.